Aimersoft iPhone Video Converter is the most popular Video to iPhone converter software that can convert video/audio to iPhone 6S/6/6/Plus, 5S/5/5C, iPhone 4S, iPhone 4, iPhone 3GS, etc. supported video and audio formats. 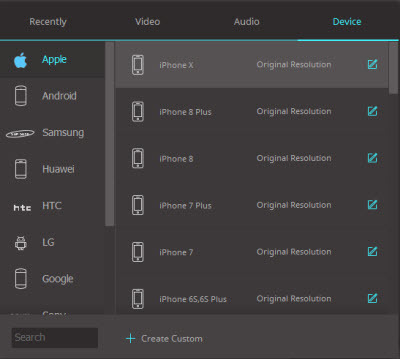 With it, you can easily enjoy any video on your iPhone! Convert video like M2TS/MTS, MOD, TOD, AVI, MKV, WMV to MP4, M4V, MOV or MP3, M4A, WAV audio formats for iPhone 6S/6/6/Plus, iPhone 5/5S/5C, iPhone 4S, iPhone 4, iPhone 3GS, iPhone 3G and iPhone. Also take screenshots from video of your favorite scenes to save and share. Just drag and click to clip your favorite parts from any video or adjust the start and end of a movie. Even split movies into multiple scenes and merge multiple video files into one large file. Utilize a toolbox of timeless effects including Old Film, Negative, and even add a watermark to personalize your video. Also add subtitles and control advanced settings like screen resolution, and bit rate to fit seamlessly with your iPhone. 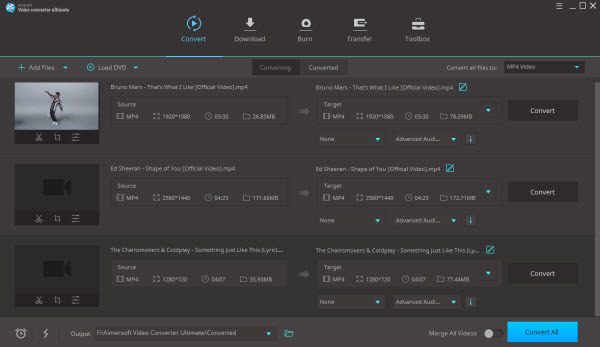 Two real-time preview window let you to make a side-by-side comparison between original video and edited one; and the multi-threading process enables you to convert multiple files simultaneously. Download this iPhone video converter and follow the wizard to install it. Run it and follow the steps below to put videos on your iPhone with ease. Click Add Files button to import video files which you want to convert or simply drag and drop video files to the source pane. Click the Output Format drop-down menu to choose which output format you want. Then Click the Output Folder to specify the destination folder for saving output file. To play video files on iPhone, you can just select "iPhone" as the output video format. When all preparation work are OK, click"Convert" button to convert video to iPhone.